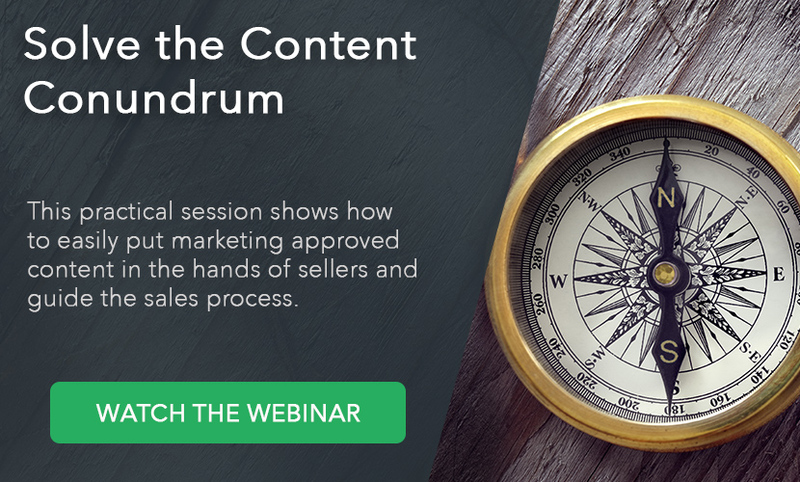 Connect Marketing and Sales by delivering dynamic, customer-centric content. 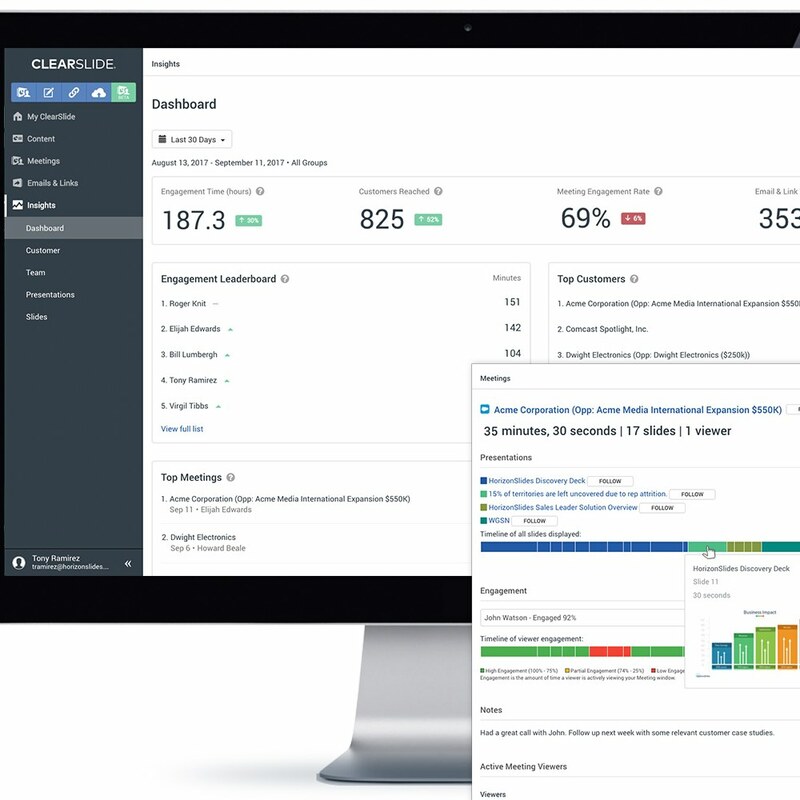 ClearSlide delivers the right content at the right time – in a way that’s trackable, measurable, and actionable. ClearSlide’s cloud content library is a single-source of truth for sales content, marketing collateral, tools, and customer-facing materials that sales teams can draw from whether they are preparing for that big meeting, in the middle of a meeting, writing an email, or on the road. Marketing and Sales Enablement teams can create and recommend marketing collateral by sales stage, customer-facing role, or industry – with recommended next-step interaction cards. Robust group-based permissions can be set by user, team, or group so sales reps only see the content that is meant for them. Detailed slide-by-slide content analytics show not just what content is being used, but also how customers respond during interactions. The For You content experience lets content creators and administrators easily designate approved content – including presentations, slides, videos, and email templates – that can be recommended by sales stage, customer-facing role, and industry. Recommend content based on engagement analytics to guide reps to the appropriate next step. For You content can also be accessed on our award-winning ClearSlide mobile Presenter App and Outlook and Gmail email plugins. 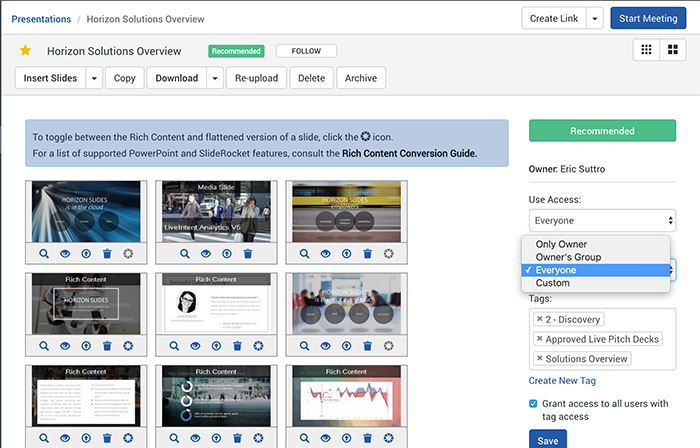 With support for all file types, seamlessly create and combine interactive slides, web-based content, videos into powerful presentations – yielding higher open rates and engagement. Out-of-the-box integrations with Dropbox, Box, Google Drive and Salesforce provide easy access to all files and assets. Offline access to content library supported via robust Mobile apps. 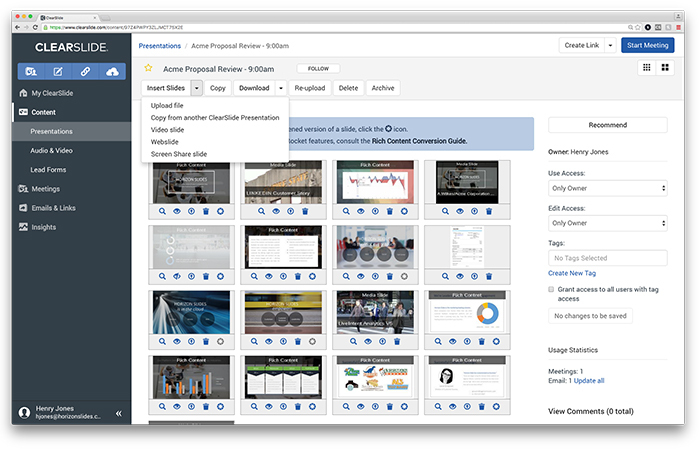 Presentation and Slide Insights dashboards deliver actionable insights for both marketing and sales teams to understand what content is resonating with customers or not. 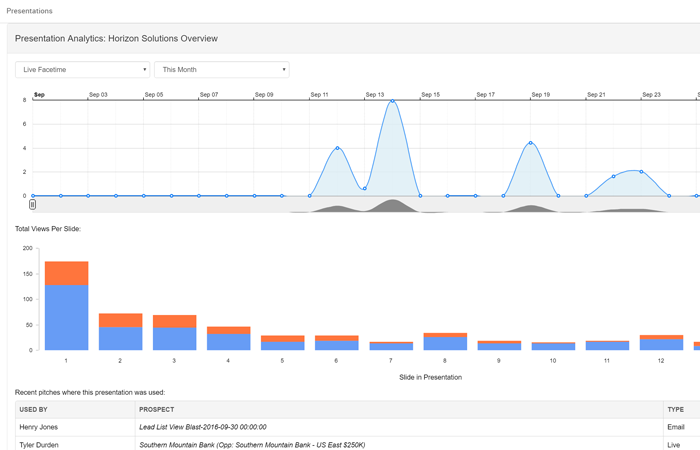 Slide-by-slide engagement analytics give visibility into content investment over time, how teams and specific reps are using approved content across communications channels, and even how effective that content is at actually engaging buyers. 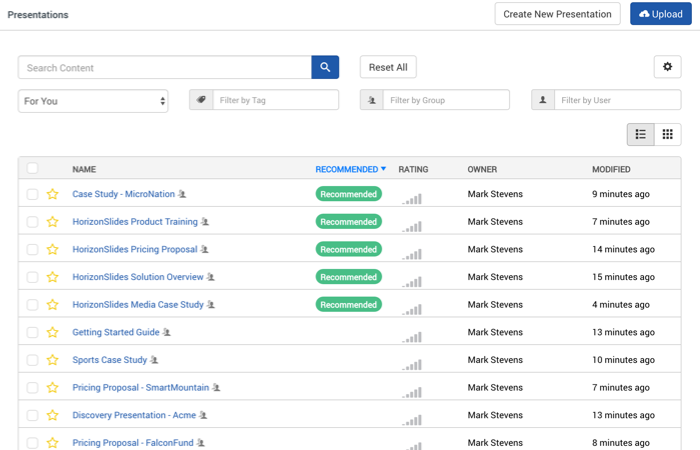 Robust group-based permissions are tailored to map to your selling process – so that sales reps across teams see the right content and tools at any point in the sales cycle. Automatically update and control content access to ensure that customer facing content is always accurate and up to date. 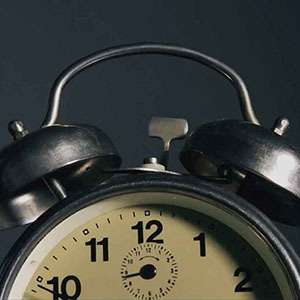 Expire and archive content with equal ease with control controls. Content is more than just presentation slides. 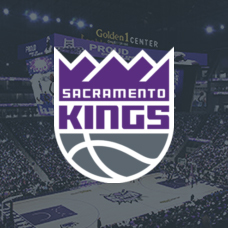 Create and customize compelling interactive collateral – combining animations, GIFs, videos, slides, and web content into single presentations to deliver higher open rates and more engaging sales presentations. Sales reps can also add personalized sales videos to any presentation using ClearSlide video mail. 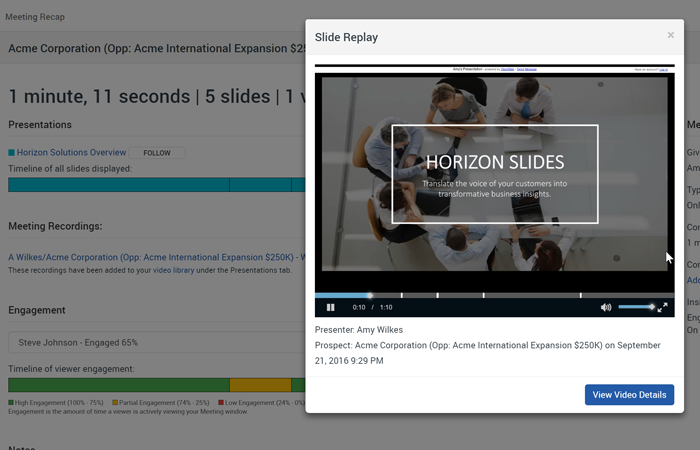 Slide Replay, now with premium audio, helps sales and marketing leaders to understand slide-by-slide exactly how customers are responding to positioning and content. With one click you can listen to a series of recorded calls for entire presentations or single slides – so they can quickly tune content and scale across the organization.